A four-alarm fire broke out at the American Legion outpost in Frankford on Memorial Day. 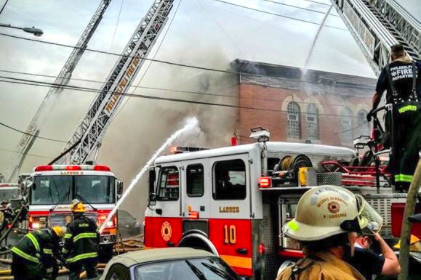 Firefighters responded to the scene of a four-alarm fire at American Legion Post 396 on Memorial Day, says the Philadelphia Fire Department. The fire broke out Monday afternoon at 2369 Orthodox Street at the Boleslaw-Grochowski outpost in the Frankford neighborhood. Retired policeman Joe Szott captured the scene of the fire on a live Periscope stream around one hour after it started. Smoke was still billowing out of the building when he got there, and a crew of firefighters were dousing the flames. "When I got there, they struck the third alarm and then the fourth alarm...you don't get four-alarm fires unless it's something really, really big," he said. The Fire Department successfully prevented the fire from damaging other properties, although two nearby homes were evacuated as a precaution. "It's in a close community. It's all occupied dwellings in that area, where that building was, so they were worried about it spreading to any dwellings, which it did not," said Szott. As ABC 6 reported, around 20 to 30 veterans plus their families were inside the building when someone noticed smoke coming out of a dumbwaiter at the end of the bar. People tried to control the flames with fire extinguishers but could not. Everyone inside was able to flee unharmed, but the Fire Department reported that one firefighter did sustain minor injuries. The fire could strike a serious blow to the veterans of Post 396, who have used this building for nearly a century.